Mars Science Laboratory systems engineer Bobak Ferdowsi at the Jet Propulsion Laboratory in Pasadena, Calif., is seen reacting after the Curiosity rover successfully landed on Mars on Aug. 5, 2012 (PDT; Aug. 6 EDT). 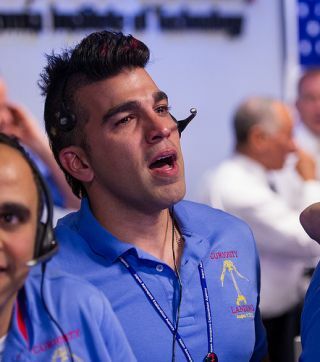 PASADENA, Calif. — NASA's celebrity flight director, Bobak Ferdowsi, would represent a rare breed even without the patriotic mohawk hairstyle that earned him fame as "Mohawk Guy" during the landing of the Curiosity Mars rover. At the age of 32, Ferdowsi is one of the younger people in NASA's aging workforce at a time when the U.S. aerospace industry worries about holding onto young engineering talent. "Mohawk Guy" didn't attend the Space 2012 conference held here this week by the American Institute of Aeronautics and Astronautics, but experts repeatedly invoked him as a representative of young aerospace engineers during a talk on Tuesday (Sept. 11). They fretted about how the aerospace industry could attract young hearts and minds at a time when budget cuts and a shift from design to production has put emphasis on squeezing the most out of existing space technology, rather than pushing the boundaries. "Many young scientists and engineers are leaving as we're downsizing and moving to production," said Mark Valerio, vice president and general manager of Lockheed Martin. "Many young employees want to marry and start a family, and we can't tell them they'll have a job in the next three years." Aerospace companies such as Lockheed Martin and Boeing hope to hold onto younger engineers by balancing their portfolio with more appealing design projects for future technologies. But representatives from the companies also talked about the need to reshape other parts of their work cycles to fit what young people want out of careers today. "Many of us were born in the '50s or '60s when space was the national priority," said Roger Krone, president of network and space systems at Boeing. "The people we recruit now, for them, space exploration is a priority, but it's more about the work and their contributions to the team and their ability to practice their tradecraft and to work on really cool stuff." Gone are the days when NASA engineers spent a decade working toward a national goal of putting a person on the moon. The male and female peers of "Mohawk Guy" want to contribute their skills immediately and accomplish goals within a matter of months, Krone said. Krone also observed that space innovation appears to have slowed a bit for the foreseeable future, even if the relatively young aerospace industry itself has seen huge leaps within a century of evolving from the Wright Flyer to jet engines, along with the birth of the space industry in the 1940s and 1950s. Half a century may "seem like forever" to younger people such as "Mohawk Guy," Krone said, but it's still a remarkable amount of progress. "We perhaps have to be more patient than we have been in the past —more patient than I have been —because I've expected a breakthrough every 10 years and I lived through it," Kroen said. "We also have to redesign ourselves to meet the expectations of the workforce." Having younger talent among the ranks of NASA or the aerospace industry may also add the side benefit of making it easier to appeal to the broader American public — something that "Mohawk Guy's" boss recognized. "More people probably watched the YouTube videos and connected to 'Mohawk Guy' than connected with the [Curiosity] landing itself," said Charles Elachi, director of NASA's Jet Propulsion Laboratory. You can follow InnovationNewsDaily Senior Writer Jeremy Hsu on Twitter @ScienceHsu. Follow InnovationNewsDaily on Twitter @News_Innovation, or on Facebook.